This psalter is believed to have been made in south-west England, probably, New Minster, Winchester, because of the style of its handwriting and decoration along with the prayers added to the end of each psalm. Moreover, at the same time it was made in the mid-11th century or soon after, a scribe, perhaps the same who wrote the Latin verses, added between the lines a translation (continuous gloss) in Old English. 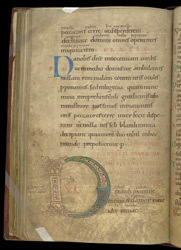 Psalter translations have a long history in England, the earliest being one in a Mercian dialect of the 9th century in the Vespasian Psalter, which is also in the British Library. The translations reflect the use of psalters as prayerbooks by laity as well as priests, monks and nuns. Many people in Anglo-Saxon England would have had a daily familiarity with the psalms--from hearing them recited if not from reading them. On this page, with the end of Psalm 100 (101), the prayer (or 'collect'), labelled 'Oratio' (prayer) in red, can be seen at the end of the psalm. In this manuscript, these prayers were added for each psalm recitated during the divine office or daily prayer services of the monastery or convent. The latin collects, however, are not provided with Old English translations. Only corrections are written in, as can be seen just below the middle of the page, the word 'ut' is underscored with dots and the correct word 'et' written above. The large decorated first letter of Psalm 101 (102) marks it as the beginning of one of the eight divisions of the psalms accommodating the divine office: one section for each day of the week plus one for vespers (evening prayer services).